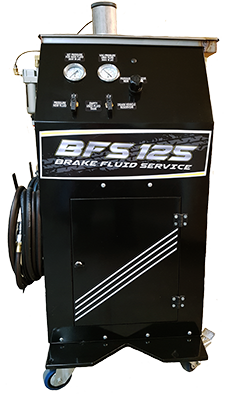 This brand new brake machine is now using the a venturi vaccum system. Saving costs on replacing pumps and motors. Easy to use with one of the many adapters provided to fi t most manufactured vehicles. As well this newly designed machine is made with a chemical resistence powder apoxy paint to help with-stand brake fl uid that it may come in contact wth. Solid base and castors with a brake so the machine stays in place.